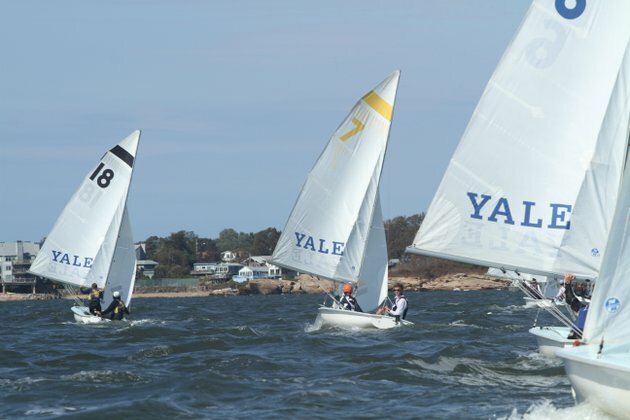 Penn Sailing traveled to the Yale Corinthian Yacht Club in Branford, CT, this past weekend to compete for the Mosbacher Trophy and the Ivy League Championship. Penn was one of fifteen teams competing for the Owen, Mosbacher and Knapp Trophies, and finished 5th among the Ivy League teams. Freshman Jack Swikart and senior Kelsi Schoenrock sailed A division, and Juniors Mike Russom and Christina Johns sailed B division. On Saturday, the team arrived at Yale to a steady 10-15 knot breeze for the start of racing at 10:30 that tapered off as the day went on. Eight races were sailed in each division. After the first day, the Quakers were in 7th place overall. Sunday was a bit lighter, with a 5-10 knot breeze that consistently died and shifted throughout the day, making for tough conditions. Four races were sailed in each division, and Penn ended up 10th overall. Congratulations to the Yale Bulldogs for winning the 2012 Old Guard as well as the Mosbacher Trophy. The team is looking forward to two full weeks of practice before competing at Ocean County College on April 7-8th in the OCC 2-on-2 team race. The Truxtun Umsted Intersectional (a.k.a. “The Trux”) is held each year at the US Naval Academy in Annapolis, MD, and is widely regarded to be one of the most competitive college sailing events of the year, rivaled only by its fall counterpart Navy Fall, the ACCs, and the National Championship. The Quakers looked to improve their national standing by competing in this prestigious event among a tough field of 20 schools, which featured 17 of the top 25 schools nationwide. Freshman Jack Swikart skippered the A Division, while Junior Christina Johns held down B Division. The Trux is a four-division regatta that features Laser Standards and Laser Radials, so Junior Captain Mike Russom anchored the team in C Division while Freshman Matthias Chia took on the D Division in only his second collegiate event. Senior Kelsi Schoenrock crewed for A Division while Marina Reppucci and Ali Zablocki, both seniors as well, split time crewing in B Division. The summer-like weather the team enjoyed all week in practice followed them into the weekend on Saturday as they arrived to sunny skies, mild temperatures and a light breeze. Each division sailed four solid races in the morning before the breeze began to fade and the race committee called the sailors in for lunch. Unfortunately, the dying breeze never returned, and racing was called off late in the afternoon. After Day 1, the Quakers found themselves in 17th place, just behind the Terriers of Boston University. Yale led the event after day 1. The sailors were not as lucky with the weather on Sunday, as the morning brought cloudy skies, a thick fog, and no wind. The race committee postponed on shore until about noon when a light easterly began to fill in, at which point all 80 boats left the dock looking to finish a few races before day’s end. The conditions proved difficult for the race committee, as they could not get a steady breeze to set the course until almost 2:00. The race committee fired off two quick races in the last hour of racing, bringing the regatta total to six. The Quakers fared well on the day; behind two very strong races by Captain Mike Russom in the Laser Division, the team managed to overtake Boston University to finish the regatta in 16th place, just one behind Harvard. Yale won the event, followed by Tufts in second and Brown University in third. A special thanks to the Navy Midshipmen who, in addition to hosting the event, held a top-notch cookout on Saturday afternoon for all the sailors. Freshman Jack Swikart and Junior Captain Mike Russom were back in action this week as they traveled to Washington College in Chestertown, MD to compete in the 2012 WAC 2 on 2 Team Race Invite. Juniors Jose-Maria Barreros and Audrey Boles did a wonderful job in the front of the boats as they split time crewing for both skippers in the varying conditions. On Saturday, the Quakers were met with steady winds around 11 knots when they arrived at the Washington College Sailing / Crew Center. The WAC race committee did a wonderful job completing two and a half round robins (for a total of 24 races averaging about 8 minutes in length) throughout the day before the unusually low “full moon” tide prevented further racing. The Quakers ended the day in second place with an 8 – 2 record with the two losses coming from WAC and Villanova in the first and second round robins, respectively. On Sunday, the Quakers were excited to arrive at the Sailing Center to a steady 8 knots with little chop- conditions that Jack described as being “perfect for team racing.” The team finished the third round robin with three easy wins against Princeton, Washington College, and Villanova. As the breeze built in the afternoon it was clear that the regatta would come down to one final race with Washington College as both teams were tied with 13-2 records. The Quakers fought hard and actually beat WAC on the water with a 2,3 finish. Unfortunately, after reviewing what happened at a crowded leeward-mark rounding, the Quakers realized that they were in the wrong and opted to withdraw from the race resulting in WAC beating Penn overall 14-2 to 13-3. Regardless of the finish, the last race was exciting and reflected the competitive nature of team racing in the MAISA Division. Congratulations to the Washington College Shoremen on their victory! 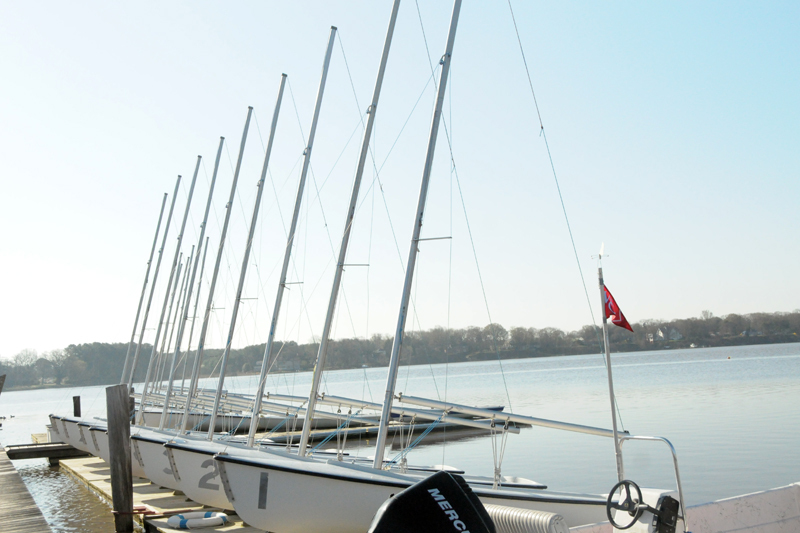 The team is excited to finally start practice this coming week at the Corinthian Yacht Club of Philadelphia. Best of luck to the Quakers as they work to prepare for the Truxtun Umsted Regatta to be held next weekend at the U.S. Naval Academy in Annapolis, MD. 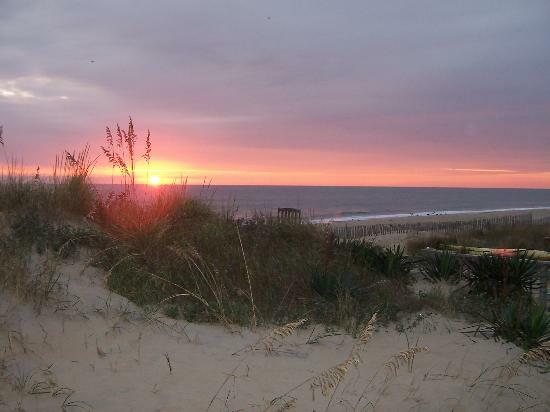 The Penn Sailing Team started off its Spring 2012 season by traveling south to Old Dominion University in Norfolk Virginia. It was also the first event of the season for many of the other teams in attendance. Skippering A Division was Junior captain Mike Russom, while freshman Jack Swikart skippered B Division. Juniors Fred Wang and Jose-Maria Barreros each crewed part of the regatta in both divisions. Saturday brought heavy rain and strong winds in the morning, but by the time the boats hit the water, the wind had died down to around 15 knots and the rain had slowed to a drizzle. Six races were completed in each division before the wind died completely and racing was called for the day, leaving the team sitting in 7th place. The team also woke to heavy rain on Sunday, but with much less wind. Over the course of the day, the breeze varied between 0 and 5 knots, allowing the race committee to get 4 more races off in each division. While Jack Swikart held the line in B Division, Mike Russom managed to shake off the rust, finishing his A Division series with two bullets and propelling the team to an overall 5th place finish. Navy took the win, followed by St. Mary’s and Old Dominion. A special thanks to the Landy family, who graciously hosted the team for the weekend.